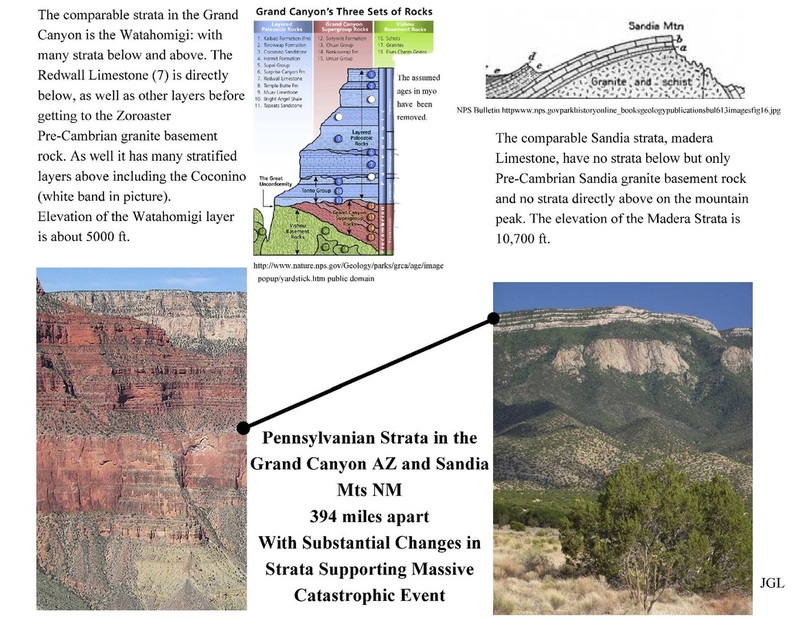 It should be noted that there is a supposed gap, an unconformity, of one billion years between the Pennsylvanian exposed top layers of the Sandia Mts and the underlying Sandia Granite. Yet just 394 miles to the west that same Pennsylvanian layer is deep under overlying strata and has thick layers of strata before reaching the granites below. There is also a (Great) unconformity at the base of these strata, at the Tapeats, interface with the Vishnu granite. These observations are supportive of vast ebbing and flowing of watery layers, with rapid alternating deposition and erosion that varied greatly in these nearby regions.That it was rapid is supported by the fact that there is no erosion of the contact of the Hermit Shale and Coconino sandstone strata-which are supposedly 20 myo different in age of deposition (see below). The data are more supportive of large scale massive and rapid flooding at least region wide. That there are sandstones like the Tapeats and Coconino found continent wide would argue for continent wide flooding (and probably cross continents). 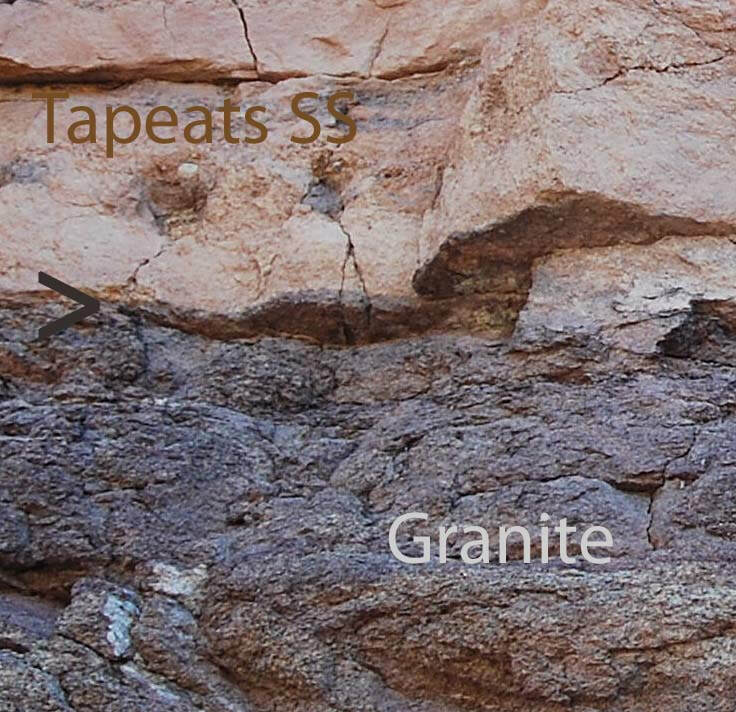 Note: The Unconformity between the Coconino SS and Hermit Shale is NOT the "Great Unconformity"; but is shown because of how such a sharp demarcation occurs between strata that supposedly have a time gap. See information below on the Great Unconformity. 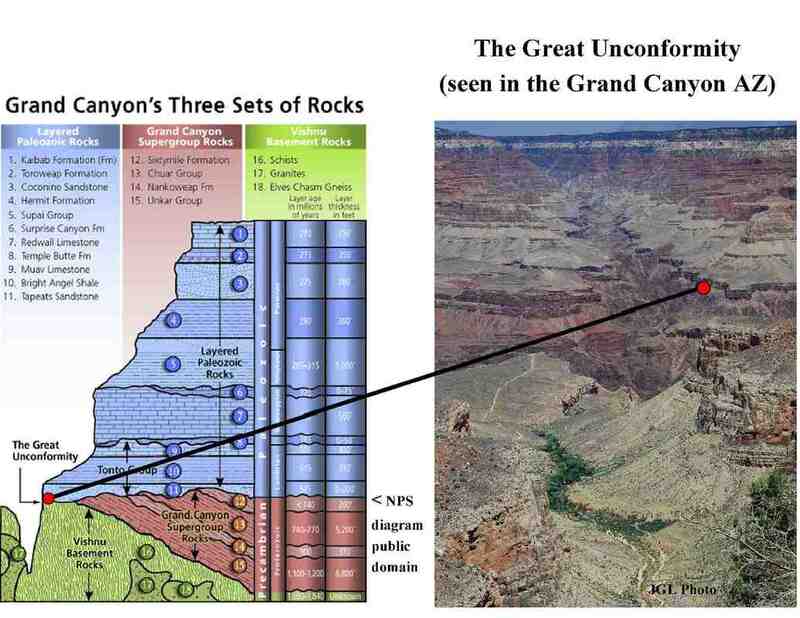 The Great Unconformity: Evidence Consistent with a Great Worldwide Flood. ​"The Great Unconformity can be traced across North America and globally, including most of today’s southern hemisphere landmasses, along with Western Europe and Siberia—this makes it the 'most widely recognised and distinctive stratigraphic surface in the rock record'...It thus records the onset of the denudation of continental crust, followed by the first major marine transgression (Sauk Sequence) and sediment accumulation on the continents...The Great Unconformity is a clear case where uniformitarianism does not apply. Extensive planation surfaces are not forming today but channel erosion is occurring today.The very high energy erosion of the global Flood would have had the capacity to wear down Precambrian cratons to simultaneously form the Great Unconformity as a peneplaned surface over tremendous areas of the earth..." See CMI article on link below for more information. 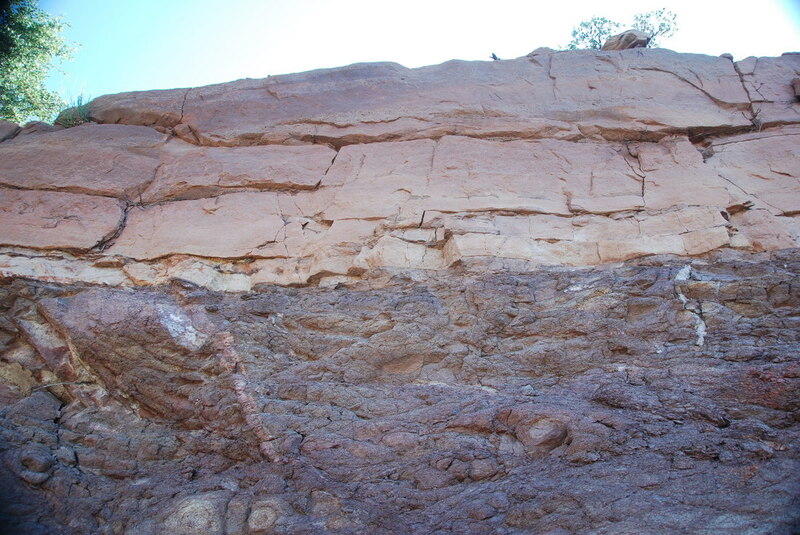 The Purplish colored rock is unconsolidated granite (possibly Vishnu as seen in the Grand Canyon), and the pale pink rock is Tapeats Sandstone which is stratified. There is a supposed gap between the two sections of one billion years-yet the contact surface is as thin as a knife blade (see image below). 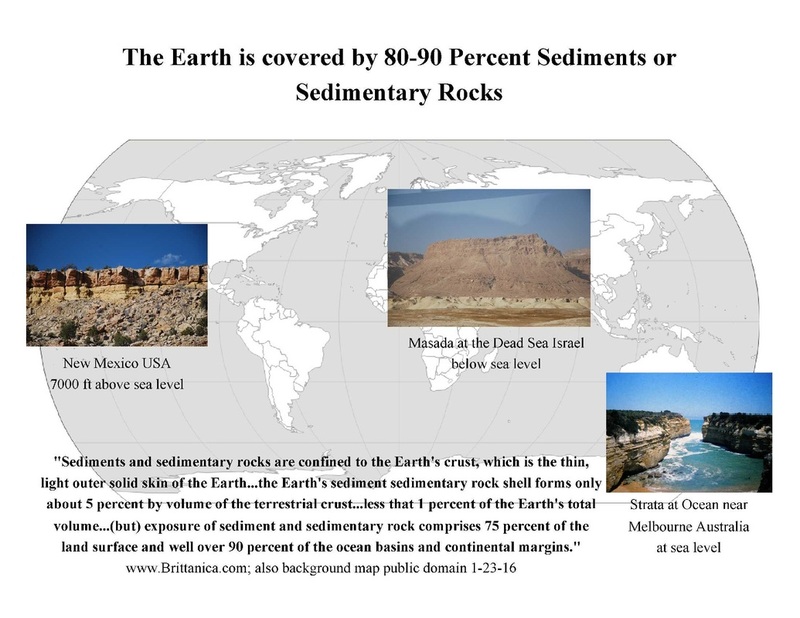 This observation can be consistent with a scouring of the earth down to the granite layer and then re-deposition of earthy material over vast areas as in the Great Flood. This would not require a large non-observed time gap. Close-up image with text. Arrow at the "Great Unconformity".